I wrote this book based on some of my life experiences. These are personal experiences that I overcame against all odds. I was motivated by my need for change and my longing for purpose in my life. In the spirit of Valentine’s Day and self-love, local entrepreneur and author Markita Cohen released her new book, The Beauty of Me: A Journey to Self-Love, this past Valentine’s Day. The Beauty of Me: A Journey to Self-love is both a book and a movement, created to inspire women to be their most authentic self by cherishing self-love, embracing self-acceptance, and knowing self-worth. The Beauty of Me has a faith-based focus, encouraging women to become one with the person God made them in order to achieve true freedom and happiness. “I wrote this book based on some of my life experiences. These are personal experiences that I overcame against all odds. I was motivated by my need for change and my longing for purpose in my life,” explains Markita. Markita, who comes from an educational background in Behavioral Science, Mental Health and Substance Abuse, and Organizational Psychology, uses her new book to provide young girls and women with expert advice on how to heal from difficult pasts and move toward better and brighter futures. With the simple yet powerful motto, “You find your deepest freedom from being your most authentic self!” the Beauty of Me brand is quickly emerging as a powerful movement for women everywhere. 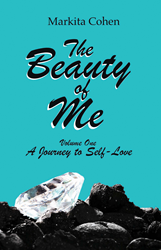 The Beauty of Me: A Journey to Self-Love is now available in paperback on Amazon.com and will be available on eBook soon. For updates on The Beauty of Me movement, visit TheBeautyofMe.com or follow The Beauty of Me Book Series on Facebook.